Over the past decade, China’s increasing presence on the African continent has been a source of global debate, excitement, and anxiety. 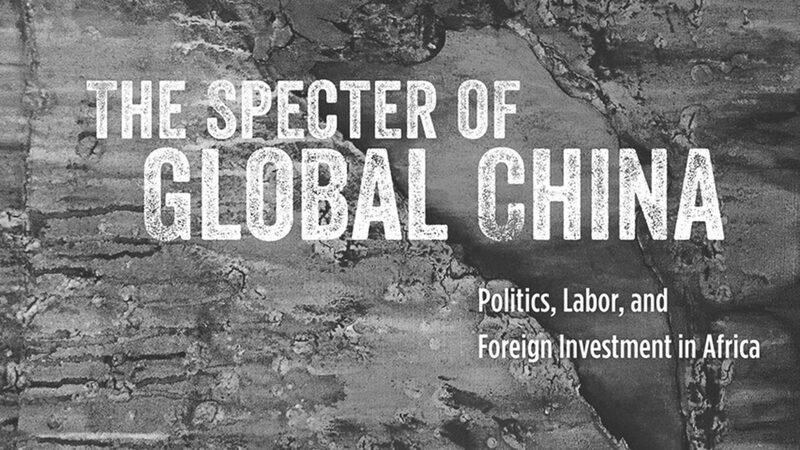 In her new book The Specter of Global China: Politics, Labor, and Foreign Investment in Africa (Chicago University Press, 2017), Ching Kwan Lee draws on six years of in-depth fieldwork to ask a new set of questions. Public debate on ‘China in Africa’ has tended to be rather hyperbolic in tone, and often fixates on China as a new colonial power. This book poses a different set of questions. Can you talk about why a shift in focus was necessary? Ching Kwan Lee: Even though terms such as scramble, empire, and hegemony resonate with many people’s fears and preconceptions, we run into serious definitional, empirical, and historical problems when we deploy them analytically, and not just for their rhetorical and political effects. Just consider some basic facts: there is so far no military occupation by China in Africa, no chartered companies with exclusive or sovereign trading rights, no religious proselytising—all things that typically accompanied colonialism over decades, if not centuries. To date, one would be hard pressed to find empirical evidence even of China’s informal ‘imperial influence’ in Africa. Rather, the phenomenon of global China is about China seeking spatial and political fixes to its resource and profit bottleneck, in the context of a national and global over-accumulation crisis, with no preordained or guaranteed outcome. For me, what is theoretically and politically significant about China in Africa is not the millions of migrant entrepreneurs or private companies from China. These types of investors hail from different countries (not just from China) and are found in many parts of the world (not just Africa). What is most intriguing is Chinese state investment, and the question is whether it represents a variety of capital that is different from global private capital—whether it has peculiar interests, practices, and ethos. If so, does it bring distinct potentials or perils to African development? The key finding of this study is that Chinese capital in Africa can, indeed, be different in nature than global private capital. Can you briefly outline the defining features of Chinese capital’s divergence? CKL: Through a sustained comparison between Chinese state capital and global private capital in Zambia’s copper and construction sectors, I found that these two types have divergent imperatives of accumulation, driving them to run different regimes of production, which in turn were enabled by different ethoses of management. Specifically, Chinese state capital is characterised by a logic of encompassing accumulation (i.e. profit making, extending China’s political and diplomatic influence, and gaining source access to strategic minerals) as opposed to global private capital’s profit maximisation. Whereas Chinese state capital runs a production-driven regime of labour exploitation, global private capital operated a finance-driven regime of labour exclusion and casualisation. Whereas collective asceticism has animated the Chinese managerial ethos, individualistic careerism has defined that of its global private counterparts. Counterintuitively, Chinese state capital, rather than being more dominant and influential, has made more compromises to accommodate Zambian state and labour demands than global private capital has. This has happened in copper mining, in which a political synergy between the Zambian state and society has emerged during a period of rising commodity prices and resource nationalism, but not in construction, a sector marked by a lack of state strategy and labour capacity. What implications does the distinctness of Chinese capital have for labour movements in Africa? CKL: One of the key arguments I made in the book is that Chinese state capital is every bit as adversarial as global private capital, yielding to labour’s demands only under extraordinary pressure. Organised labour in Africa has the best chance of gaining concessions from Chinese state capital in sectors that are considered by all the stakeholders as strategic, and where workers are most organised. My comparison between mining and construction makes it very clear that it is miners but not construction workers who could compel the Chinese to reverse the trend of casualisation. This was because Chinese state capital, as opposed to global private capital, wanted to accumulate political capital in addition to financial capital, and was more place-bound by its desire to access raw materials at their source rather than just sell commodities for profits. Zambian miners’ collective action, when supported by societal and state pressures, could therefore yield more concessions from Chinese state investors than other private ones. In construction, African labour is rather disorganised and the construction industry is considered of marginal significance to Zambia’s national development. Neither state nor society rallied behind construction workers’ scattered struggles. I guess the lesson for African organised labour, as is true for African states, is that they have to understand the unique sets of imperatives of Chinese state investment and develop their developmental agendas to engage and bargain with China. This book is also a call for the field of China Studies to ‘abandon its methodological nationalism’ and reconceptualise China globally. Why is this important, and what methodological and theoretical reorientations does this require? CKL: Outbound Chinese state capital is just one instance of global China. China’s global reach is taking many forms in many arenas: migration, global media networks, higher education, scientific research, regional and global multilateral credit institutions, expansion of Chinese NGOs abroad, and so forth. To understand China’s global impact in these areas, scholars cannot artificially seal Chinese phenomena within China’s geographical borders. This applies not just to topics that are intrinsically international or regional. Even subjects that may appear purely ‘domestic’—such as rural development, land grabs, social movements, corruption, governance, and elite politics—are seldom really so. For instance, land grabs in China have their dynamics and causes rooted in the Chinese political economy, but they are part of a global wave of land dispossession afflicting Africa, Latin America, and Southeast Asia, partly caused and exacerbated by a new round of speculative investment in food and agriculture by global financial capital, or by state-sponsored projects of building global cities. Comparing, connecting, and contextualising domestic Chinese phenomena with what is happening elsewhere will yield deeper and fuller understandings of events within China and, more importantly, what makes them ‘Chinese’.